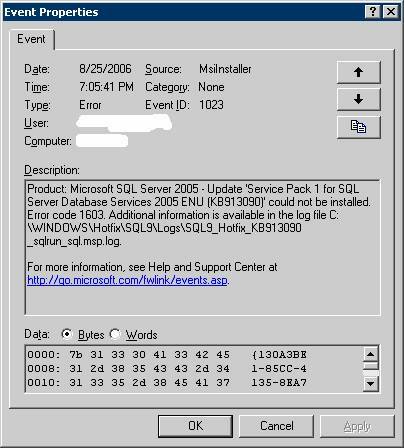 This article documents how Veritas Backup Exec (now owned by Symantec) causes the SQL Server 2005 Service Pack 1 install to fail. It also documents how to fix the problem even after a failed install attempt. 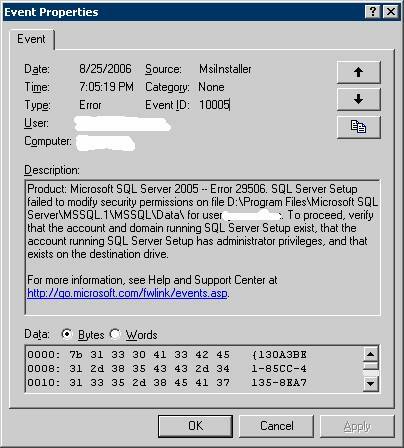 This web page is part of a collection of web pages containing difficult to find technical information about Microsoft SQL Server 2005 Standard Edition. Click here to go to the main index. Microsoft has a web page that covers this problem: You may receive an error message when you try to install SQL Server 2005 Service Pack 1. Unfortunately, they were too nice in this document and failed to name the guilty party (Veritas Backup Exec). This makes Microsoft’s web page nearly impossible to find with a web search at 7:00pm on a Friday night after your install has mysteriously failed several times! Unfortunately, I didn’t get a screen shot of the install program error message. All it said was something vague like “database engine install failed”. Here is popup error message that I got during the SP1 install. "A recently applied update, KB913090, failed to install"
Here are two screen shots and the error text from my Control Panel Event Log after the SP1 install failed. 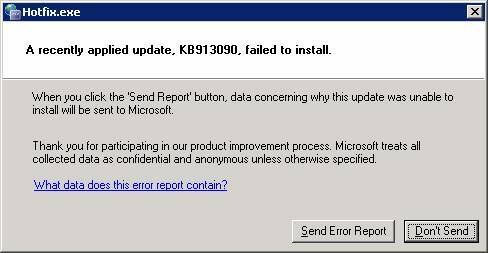 Product: Microsoft SQL Server 2005 -- Error 29506. 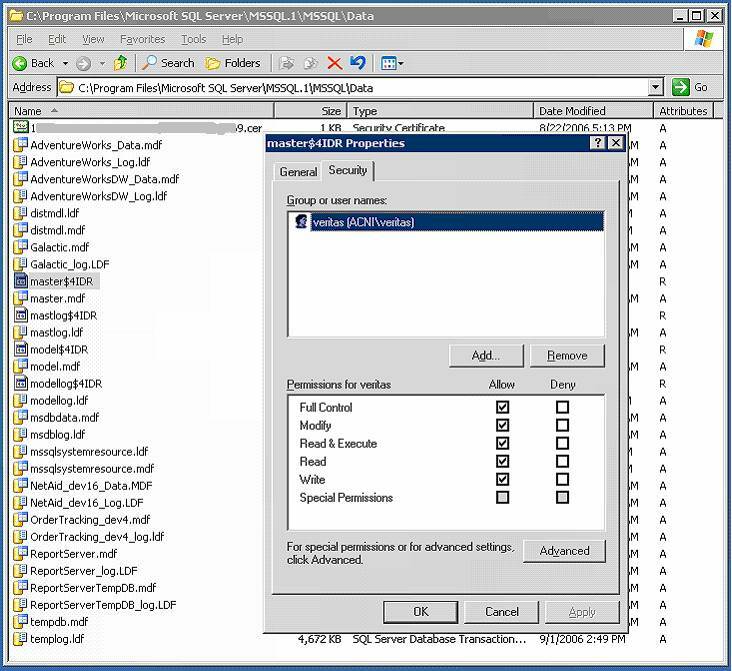 SQL Server Setup failed to modify security permissions on file C:\Program Files\Microsoft SQL Server\MSSQL.1\MSSQL\Data\ for user ... To proceed, verify that the account and domain running SQL Server Setup exist, that the account running SQL Server Setup has administrator privileges, and that exists on the destination drive. Product: Microsoft SQL Server 2005 - Update 'Service Pack 1 for SQL Server Database Services 2005 ENU (KB913090)' could not be installed. Error code 1603. Additional information is available in the log file C:\WINDOWS\Hotfix\SQL9\Logs\SQL9_Hotfix_KB913090_sqlrun_sql.msp.log. Veritas Backup Exec puts files in the same folder as your system databases. They are the files with dollar signs in them. Veritas removes all Administrator and System security rights from these files. I could write an entire web site about how hideous this design is! However, I’m trying to be a statesman on this site, so let me just simply say that this is Veritas bug and not a Microsoft bug. We fixed the problem by adding Full Control rights back to these dollar sign files for System and Administrator. We then re-ran the SP1 install and it succeeded. The previous failed install appears to have caused no harm. Veritas appears to be backing up our databases properly after this change as well. However, at some point later on (probably during the next backup cycle) Veritas deleted the Administrator and System rights from these files again! I couldn’t find anything on the Veritas/Symantec web site about this so I can’t guarantee that my solution will not cause problem with Veritas. Note: If you have just had a failed install I strongly recommend rebooting the server before trying this fix.